Only flying during daylight and in good weather. Only flying within line of sight. Fly below 300 ft altitude. Fly within 500 meters lateral distance of yourself. Never fly within 5.5 km of any airports. 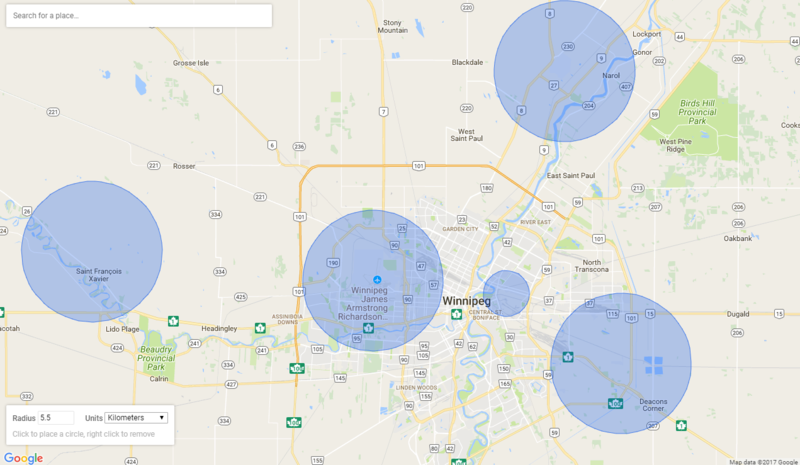 In and around Winnipeg, this includes the Winnipeg James Armstrong Richardson International Airport, the Lyncrest Airport. Never fly within 1.8km of any heliports. This includes the Health Sciences Centre Heliport, and the City of Winnipeg Heliport. Please note that the taking off or landing of any aircraft (even model aircraft, and technically even kites and frisbees) are prohibited in all national parks as per the National Parks of Canada Aircraft Access Regulations, unless you have a permit issued by a park superintendent. We also encourage all participants to join the Model Aeronautics Association of Canada and adhere to all their safety guidelines. On August 21, 2015, Transport Canada issued a Civil Aviation Safety Alert on Unmanned Air Vehicles, basically reminding pilots that the Canadian Aviation Regulations state that no unauthorized person shall operate an aircraft within 5 nautical miles (9km) of a forest fire or within any associated restricted airspace.